The most powerful geologic force on the planet - glaciers. Glaciers can dominate an entire continent ... Can reshape a continent's surface features in the blink of a geologic eye ... All the spectacular mountain peaks that inspire us have been shaped by glaciers. Includes interviews with leading glacial experts from around the country. Students study mountain glaciers, continental glaciers and ice sheets. 00:04:06Glaciers and ice sheets are part of the earth's cryosphere. 00:08:48In the 19th century Louis Agassiz studying the Ice Age discovered glaciers, Sea ice e, mountain glaciers, permafrost and continental glaciation, were all changed over time and comprise a great force in nature. 00:08:40Some of the more important glacier features and phenomena of glacier dynamics are plucking, glacier calving, and can be seen in mountain glaciers, ice sheets, and what was left behind by the Great Wisconsin Ice Sheet that melted at the end of the last Ice Age. 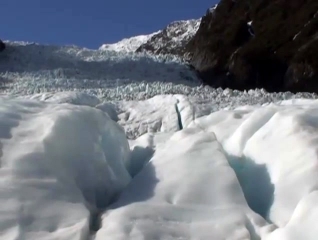 00:05:05Mountain glaciers produce interesting phenomena such as cirques, valley glaciers, glacial till, fjords, hanging valleys, ice fields and terminal moraines. 00:01:16In this time of climate change, or global warming, glaciers have become an important scientific challenge.